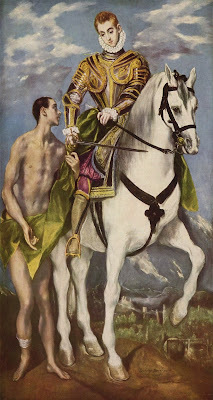 Καθολικός διάκονος: St Martin of Tours: "a man words cannot describe"
Today is the Feast of St. Martin of Tours, Armistice Day (the day World War I ended), Veteran's Day, and my birthday. I think of today in that order (it is also the birthday of Fyodor Dostoevsky; yesterday marked the birthday of Martin Luther, who was named in honor of the great Bishop of Tours). Of course, St. Martin was a soldier who had a profound conversion, which made him a servant of Christ, thus a servant of peace. He went on to become the bishop of Tours in what is now modern day France. While his cultus has shrunk dramatically, for a long time he was a highly revered saint, along the lines of St. Francis of Assisi and St. Thérèse of Lisieux. It is fitting that Armistice Day and Veteran's Day (as a combat veteran today is a day I pray for peace in an especially fervent manner) are observed on his feast. It is the Feast of St. Martin that makes today far more than a secular observance. St. Martin lived in the fourth century (316-397). Living to be 80-plus years-old in Europe at that time was a rare occurrence. Martin was consecrated Bishop of Tours in 371 and served until his death. Sulpicius Severus, a Christian writer and chronicler who lived in the fourth century and into the fifth, wrote a biography of St. Martin. Sulpicius' moving account of St. Martin's death is the second reading for today's Office of Readings in the Church's Liturgy of the Hours. You can hear a lovely song dedicated to St. Martin of Tours here. In his old age, when he knew he was dying and had not long to live, St. Martin, upon being informed that the clergy in the town of Candes, which was in his diocese, were fighting, despite his age and illness, he went to reconcile them and to restore peace. While he was at Candes, but after he had restored peace, his health took a turn for the worse and he died. As he lay dying his spiritual children, according Sulpicius, implored him, saying, "Father, why are you deserting us? Who will care for us when you are gone? Savage wolves will attack your flock, and who will save us from their bite when our shepherd is struck down? We know you long to be with Christ, but your reward is certain and will not be any less for being delayed. You will do better to show pity for us, rather than forsake us." Upon hearing their pleas "he broke into tears, for he was a man in whom the compassion of our Lord was continually revealed. Turning to our Lord, he made this reply to their pleading: 'Lord, if your people still need me, I am ready for the task; your will be done.'" Martin, as he is remembered, "was a man words cannot describe. Death could not defeat him nor toil dismay him. He was quite without a preference of his own; he neither feared to die nor refused to live. With eyes and hands always raised to heaven he never withdrew his unconquered spirit from prayer." He is said to have caught a glimpse of the devil on his deathbed. His response was to rebuke Satan firmly, saying, "Why do you stand there, you bloodthirsty brute? Murderer, you will not have me for your prey. Abraham is welcoming me into his embrace." Easter Sunday. A beautifully sunny [rest] day. I’m writing in a field beside a brook — I can easily imagine myself back in England. We’re all struck with the strangeness of things; one week in Hell and the next in comparative bliss. St. Martin is the Patron Saint of beggars, reformed alcoholics, soldiers, tailors, and (oddly enough, in that lovely Catholic manner) also of wine-growers. Sanctus Martinus Turonensis, ora pro nobis.